Have you ever considered how much you use the word good in your daily conversations? What does it really mean, anyway? Think about the last time someone asked you how your day was. What was your response? Did you happen to use the word good, by chance? When I work with any group of students, the very first question I ask is, “How is everyone doing?” As you can probably guess, their answer is almost always one word – good. Even more, it’s often said in a very monotone voice. It’s safe to say that you’ve frequently used the word good, perhaps without even knowing it. I want to make it very clear that my intention with this blog is not to be the word police. I’m not interested in telling you what words must be a part of your vocabulary. That is ultimately your choice. I do, however, want to heighten your awareness with regard to the tremendous power of our words. Do me a favor and say the word good out loud several times. As you do this, I want you to recognize the energy you feel as you say it. On a scale of 1-10, with 10 being the most energetic and 1 being almost apathetic, how would you rate your energy? Now I want you to say the word great out loud several times. Again notice the energy you feel as you say the word. How did you rate your energy this time? I’m guessing that your second number was higher. Am I right? Let’s examine why this is the case. Every emotion word in the English language, of which there are close to 3,000, carries with it a certain amount of energy. Some words such as hate, anger, or frustration evoke negative energy. Other words such as loving, joyful, and optimistic evoke positive energy. Then there are words like content or relaxed which can be neutral in nature. 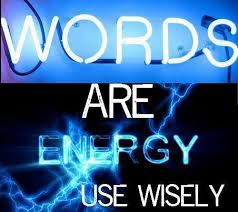 Depending on the tone of our voice when we say the words, the level of energy can be amplified. What kind of energy does the word good invoke? I would say that it’s neutral. A central theme in my teachings is that the lens through which we view the world will greatly affect the quality of our lives. These lenses are made up of words, which ultimately shape our thoughts. Our thoughts influence our feelings, and our feelings influence our actions. Simply put, everything begins with the words we choose. Considering the word good contains neutral energy, I’d like to share some other alternatives that will leave your child feeling much more empowered and full of positive energy. I overheard my wife saying this to our 7 year-old as she left the house a few weeks ago, which actually prompted this blog. Not only does this statement use the words like shine and light, which both evoke positive energy, it also empowers the child to play an active role in their day. It reaffirms to them that who they are (their light) greatly influences others. Make it a fabulous day. Aside from the word fabulous, which is much more meaningful than good, this statement implies that it’s ultimately the child’s choice as to whether or not the day will be fabulous or not. It puts them in the driver’s seat of their day. Regardless of whether or not the circumstances of the day turn out the way they’d like them to, the way they see the day (their lens) is entirely within their control. Similar to the first statement, these words imply that happiness is a choice, not a destination. Let’s face it, every parent wants their child to be happy. However, we often support the notion of happiness as a destination by giving them frequent rewards for things like grades or behavior. These rewards can serve as a destination in a child’s mind, which leaves happiness as something they have to get, rather than create. By my calculations, every parent will send their child(ren) off to school approximately 180 times a year. That’s 180 opportunities for you to plant seeds of positivity and optimism in their minds as they begin their day. I challenge you to reconsider the words you use. Oh wait, I mean, MAKE it a FABULOUS day and remember to SHINE your LIGHT, all the while recognizing that HAPPINESS really is a CHOICE.